This isn’t Heights related, but it is twisted. All of a sudden we have Save the Dome, after year of neglect and tons of money spent on it. Never mind that we passed previous bond issues on this money pit. Never mind that we had promises from our previous football team. Never mind that the county has continued to bungle the dome for years. All they want this go-round is another $217 million bond issue. Who can blame the doubters when looking at all the trumped-up numbers predicted for event income. They just want us to trust them…this time they really mean what they are promising. I like historic buildings; I like old things in general; I don’t like boondoggles. Tear it down. Tear it down now. Otherwise 5 years down the road we’re going to be asked for more money because UNEXPECTEDLTY, the touted events never materialized! That’s my two cents worth. Now for the other side, a more cogent plea from the Chronicle. Excerpt: On the topic of expense, claims that the Dome’s finances would break even do raise some eyebrows. The numbers we saw look like optimistic back-of-the-envelope calculations, which seem to presume every obscure sporting competition from ESPN 3 on down will sign up for the Dome on opening day. And while county officials said that they don’t expect to spend the entire $217 million authorized, the county still would have to raise taxes to pay for it. At the most, the annual tax bill for a $200,000 home with a 20 percent homestead exemption would increase by $8. That is a price worth paying to save our past and invest in our city’s future. After all, preserving the Dome should be the first step of reshaping the entire Reliant Park. If this passes, we urge the county to think bigger about transforming one of world’s largest parking lots into a comprehensive expo, hotel and green space – a Discovery Green South. I will also give credit to Slone Gallery on S Dairy Ashford. 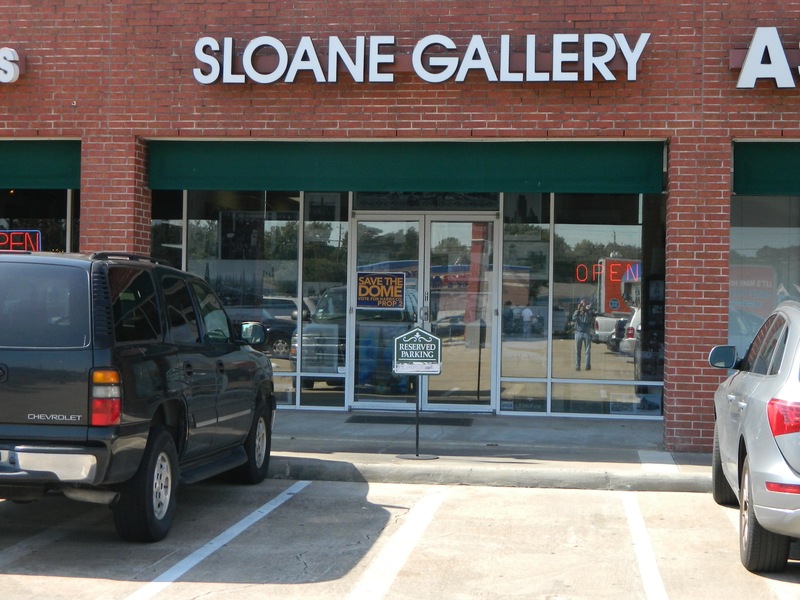 Story Sloane’s motto is “preserving Houston’s history, one image at a time!” He has some fantastic old photos of downtown Houston; even a few with the Heights in it. 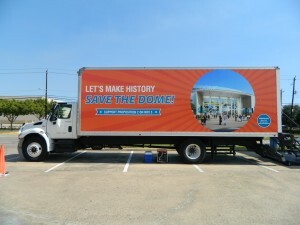 I happened to be there the day he had the Save theDome truck on site. Photos above. Here’s an idea…instead of spending $217 M on this, why don’t we each just buy some of the seats on sale now. We can each preserve a piece of history. The choice is yours November 5th!